A fantastic way to get quickly immersed in the realm of modular synthesis without the hassle of lugging a huge case around. Novices will need to do their homework. Those infected with the modular bug often end up with a huge Eurorack system that you can't just pop down to the club with for an average gig. However, the Asheville, North Carolina-based Make Noise outfit is known for making portable systems that travel extremely well yet still provide great creative depth. Enter the 0-Coast, or 'No Coast' as it is pronounced. Designed to emulate the sensibilities of both the Moog and Buchla/Serge worlds, this compact piece of kit is about the size of a tablet computer, yet still packs in a tremendous amount of sonic creation and manipulation options for a very tidy price. 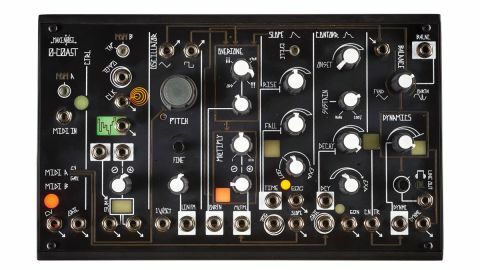 Boasting a handful of new Make Noise circuits, the 0-Coast is designed to offer up a range of synthesis options while being beholden to none. In fact, unlike similar patchable rigs where there's a minimum amount of cabling required to generate a sound, the 0-Coast comes internally pre-wired (or 'normalled') and can thus operate as a simple monosynth straight out of the box. With the use of the included standard MIDI DIN to 3.5mm adaptor you can play and sculpt the base sound of the instrument (a blend of the fundamental triangle core VCO and any applied overtones) as if it were any other sound module. Once you begin patching, however, this base level circuitry is overridden so that the unit can deliver a variety of options with or without the use of external gear. Starting over on the controller section, the 0-Coast not only features MIDI In, but also a tappable clock generator, which drives the onboard random voltage generator. The Tempo input can receive exactly that from external modules while just below that connection is a Clock output to do the reverse. The unit has not one, but two channels of voltage processing input (a la the centre channels of their popular MATHS module). Adding, subtracting, offset, inversion and mult-ing are all on offer here and because there are a pair of identical outputs the results can be sent to two separate destinations. Just to the right, the sole VCO outputs both fundamental triangle and square waveforms with both regular and fine pitch tuning. The oscillator accepts voltage control over 1V per octave and alongside there's a variable pot for linear FM inputs. In terms of sound, Make Noise never seems to fail on building circuitry that delivers both personality and depth. The amount of the fundamental versus the Overtone side of the signal is managed by the Balance circuit on the extreme right side of the instrument, which crossfades between the two. The new Overtone and Multiply circuits add complexity or 'overtones' to the fundamental, which can then be multiplied, as you might imagine, via the Multiply section. Both Overtone and Multiply feature their own CV input attenuvertor pot. Modulation is brought to 0-Coast with the Slope and the Contour sections. The 'West Coast' style Slope generator (similar to a single channel of MATHS) is a two-stage job similar to old Buchla gear that also features a time-based control jack as opposed to independent rise/fall. You can get the circuit to cycle by pressing the Cycle switch. Also, because the output of the Slope circuit is normalled back to the Multiply circuit, switching on cycle will allow the two to interact. Contour is an 'East Coast' four-stage envelope generator inspired by the loudness contour on the original Minimoog Model D that includes onset, sustain, and decay (which sets the onset to sustain levels as well as the sustain to zero signal level). Make Noise has also added a shape controller in this section that goes from linear to exponential. The Balance circuit also feeds the Dynamics circuit, which mirrors the functionality of a low-pass gate. What's not so evident from all the knobs and pots on the 0-Coast is the amount of programmability Make Noise has built in. First off there is an onboard arpeggiator (yay! ), which offers both Latch & Shift OFF and Latch & Shift ON modes. There's also two legato modes, MIDI learn for both A and B channels, as well as MIDI clock and calibrate. And because the spare MIDI B output offers both CV and Gate outputs they can be used to work with velocity, aftertouch or a mod wheel. In terms of sound, Make Noise never seems to fail on building circuitry that delivers both personality and depth. The subtleties of dialling in overtones and then fattening them up with the Multiply circuit bring a great amount of variation to the table. And then being able to modulate those sounds across two distinctly different paradigms richly broadens the scope of creative options. Approaching the 0-Coast is a far simpler exercise than what the novice Eurorack user (or modular user in general) has to face when first coming to grips with creating sound from the ground up. Those who'd like to explore the depths of the Program Pages might grumble about there not being some sort of LCD screen to ease navigation, but the initiated will tell you that when moving from one Eurorack vendor (where standards are few) to another continued acclimation is just the nature of things. Besides, is there really a lot to complain about with a reasonably priced sound module of top-shelf quality that bundles nicely into a rucksack along with a laptop and a small MIDI controller? Not really. That is, until the disease begins to spread and you can't imagine not bringing along x, y, and z module to flesh out that new mobile rig.